A good knife is perhaps the most important item in a hunter’s tool kit. A hunter needs his knife for cleaning game and for all sorts of tasks that may arise during the hunt. As any knife enthusiast will tell you, a sharp knife is safer than a dull one. The key to keeping a hunting knife in good, safe, operating condition is a good sharpener. There are a multitude of knife sharpeners in different shapes and sizes and with different operating instructions. Different knife sharpeners will be better suited to people will different experience in using sharpeners. For an all-around fantastic knife sharpening experience, get the Lansky BladeMedic. This portable sharpener is small enough to fit in a pocket and solid enough to stand the abuse of heavy use outdoors. 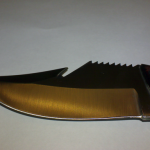 It boasts four sharpening tools: A fixed tungsten carbide slot restores a blade in no time; Fixed-angle ceramic rods polish off the rough edge to factory finish; A ceramic plate fits in any size serrations, leaving serrated blades in like-new condition; A diamond-tapered rod quickly reconditions and maintains a knife’s edge. The best thing about the Lansky BladeMedic is that it is incredibly simple to use. Anyone, even those with no knife sharpening experience, can quickly and easily improve a blade’s condition. Second, the Lansky BladeMedic is cheap. It is available on Amazon for as little as $10. 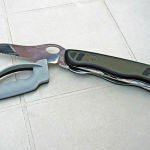 It can handle almost any knife or tool that might require sharpening: both regular and serrated blades, fishhooks, garden tools, and most other tools. The carbide and ceramic slots are both angled at 22.5 degrees, leaving a 45 degree edge, which is appropriate for hunting equipment. The downside of the Lansky BladeMedic is that it is relatively heavy, but that is due to its solid metal construction, so it is well worth the weight. Hunters with more experience using unset sharpening methods might be interested in the Smith’s 3 in 1 Field Sharpening System. The System is larger than the BladeMedic, over 10 inches in length, and probably could not be carried in a pocket, but would fit easily into a pack. The 3 in 1 Sharpening System features a set tungsten carbide slot, just like the BladeMedic, but also features sharpening grooves for hooks or small tools, ceramic v-rods, and an interrupted-surface diamond stone. The preset carbide blades set the edge quickly, and the fine-grit diamond stone takes that edge to razor sharp. The specially shaped ceramic rods provide a wide range of sharpening capabilities, from serrated blades to hooks and tools. This portable field sharpener is often compared to the Syderco Sharpmaker, which is widely regarded as the acme of knife sharpening systems. The Smith’s 3 in 1 Field Sharpening System is a masterwork of versatility. It gives a hunter a huge amount of options for any sharpening task, although it does demand a bit of work-space and a flat working surface. It is affordable; though double the price of the Lansky BladeMedic. Smith’s is among the most well-known and trusted brands of the knife sharpening world. 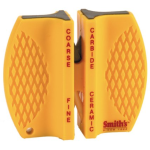 For the most experienced knife sharpeners, those who want more personal control over the angle of the cutting edge, the Smith’s Diamond Combo Sharpening Stone is a natural fit. This tool features two stones of different grits, one coarse and one fine, affixed to a comfortable, non-slip handle. The coarse diamond stone is 325 grit, which is more aggressive than would normally be needed for well-maintained knives but effective against edges that have been damaged by regular overuse. The interrupted diamond stones bring results faster than uninterrupted stones would. The Smith’s Diamond Combo Sharpening Stone can be used either dry or using water as a lubricant. The real diamond stones can be used to sharpen even carbide and ceramic blades. The Diamond Combo Sharpening Stone is priced the same as the 3 in 1 Sharpening System. A knife is an invaluable hunting tool, and so a good knife sharpener is, too. A good hunting knife sharpener must be able to tackle any blade, it must be compact and light-weight, and the hunter must be able to use it. The Smith’s Diamond Combo Sharpening Stone has one fine and one coarse stone, and can be used to treat blades of all sizes, but the user must have the proper technique to get stellar results. The Smith’s 3 in 1 Field Sharpening system features four sharpening surfaces: a tungsten carbide slot, two ceramic v-rods, a ceramic hook-groove, and a fine interrupted diamond stone; it is usable on any appropriately-sized tool or blade, and gives the user flexibility without making the demands for technique that the Diamond Combo Sharpening Stone needs. It is a great system on which for novice sharpeners to hone their skills. The Lansky BladeMedic has tungsten carbide and ceramic slots, a ceramic stone for serrated blades, and a diamond-tapered rod for edge maintenance. It is simple enough to be used by beginners and those who have no interest in knife sharpening as a skill. All three are effective hunting tools, only the hunter can know which is the right choice for him.